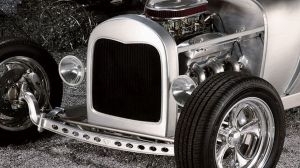 From the producers of American Chopper comes American Hot Rod, the show that gives the viewers a look at the life of legendary hot-rod builder Boyd Coddington and his crew of builders. 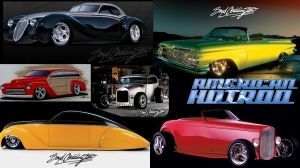 The show takes the viewers into the fast paced, complicated, and tension filled world of hot-rod building. Along the way we meet Boyd's crew and family, as they struggle to complete their classic cars before the deadline is upon them. 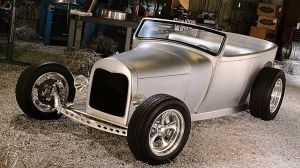 It’s just another day in the life of American Hot Rod. 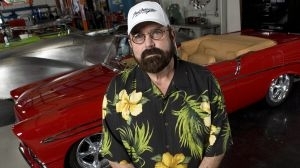 Boyd visits Hershey to get a brief on a car they want built - as a tribute to Elvis Presley. 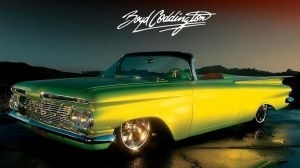 Boyd and Jo tour the factory to meet the people then head off to Graceland to get some idea's for the car. The final choice is a 57 Caddilac and Boyd gets to work. Work continues on the Elvis tribute car. Duane does not like the colour and tries to get Boyd to change his mind. Boyd and Duane take a pink dare. Jo and Robert visit the USAF Thunderbirds and get to go up in the air for a spin. 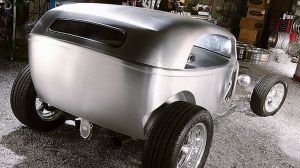 The Elvis car starts coming together and to everyones suprise the colour looks really good. Chris doesn't like the wheels though but Boyd won't change his mind. Gabe is pleased to be working with white leather for a change. The car is unveiled at the Reese's store in New York city. Sobe ask Boyd to build a promotional hot rod based on a 1960 Mercury wagon. Meanwhile the construction company are back with a special build - a wheelbarrow - in time for a convention. Work on the Mercury continues but is going very slowly as everyone is waiting for things to happen. As the deadline looms, the stress starts to affect Dwayne and the countdown clock is not helping. Everything starts coming together and the car gets into shape, including some custom surfboards. With the car complete, Boyd heads off to unveil the car at a surf event in Florida. Boyd's team starts work on a double build - a 1959 Corvette and a custom Bella Haye. The team has a new female member - will the guys accept her? Work continues on the 2 builds, while finishing up a 3rd for good measure. Duane's management style starts to take its toll and morale sinks to a new low. Al quits and Liz leaves as her and Jo don't get along. What is happening to the crew? Boyd takes some time out to make a trip to Tulsa, to watch a 1957 Plymouth Belvedere being removed from a time capsule. Will they be able to make her run?. The team finish work on the Corvette ahead of its debut... in a drag race against a modified Corvette Z06. 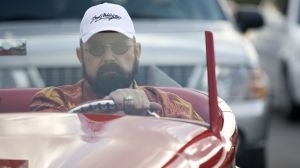 Boyds newest project is a Model T than he plans to turn into a racer for Jo to drive at Bonnieville. To get the Delahaye back on track he enlists the help of one of his customers. Work continues on Jo's Bonnieville racer and Boyd opts to put Rocky's car on hold. Duane's temper annoys everyone and there are problems with the engine. The team finish Jo's car and head off to Bonnieville. Before she can attempt the 200mph record Jo must first earn her licenses in a car she hasn't driven before.